Shopping at Costco is always an adventure. You never know what you can come across. 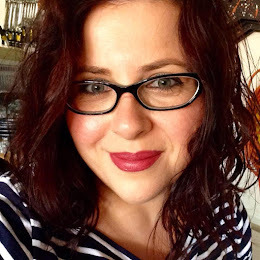 On weekends when all the testers are out, you can actually make a meal of it, and unfortunately it also means more impulse buys since you think you "have" to buy the product you just tasted. Costco's Sonoma Chicken Salad was one of those buys. It had cranberries, pecans and poppy seeds in it. 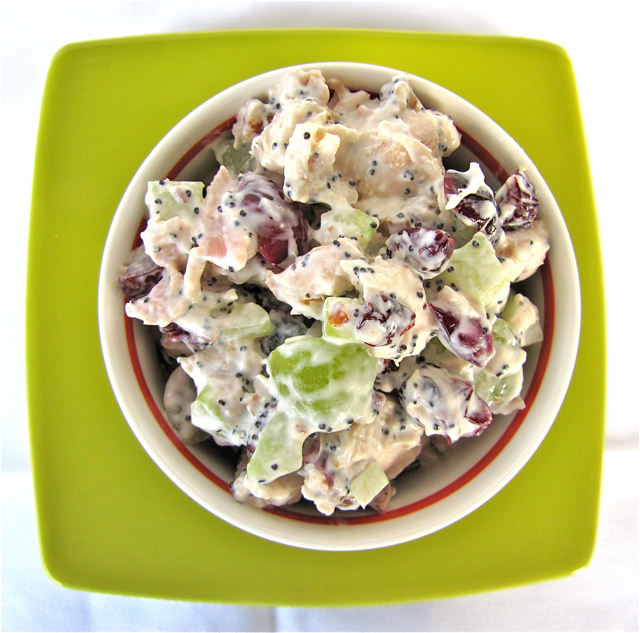 This sets it apart from a lot of the chicken salads that are out there. It was mighty tasty and we all enjoyed it. The only downside of the Costco chicken salad is that for one, it is expensive, and for two, it also has some unpronounceable ingredients mixed in along with a high calorie count. So in true fashion I decided to replicate the recipe, and we haven't bought one chicken salad from Costco since. It is a different kind of dish than what you might be used to since I add pecans, dried cranberries, poppy seeds, and grapes to my version which makes it incredibly delicious and look beautiful. Many people who I have served this to who were initially turned off by all the fruit, ended up liking it after all and I keep getting requests for the recipe. This salad can be served with crackers, with a loaf of good artisan bread or on a split croissant. It also travels well for picnics and potlucks. I hope you'll give my creation a try! 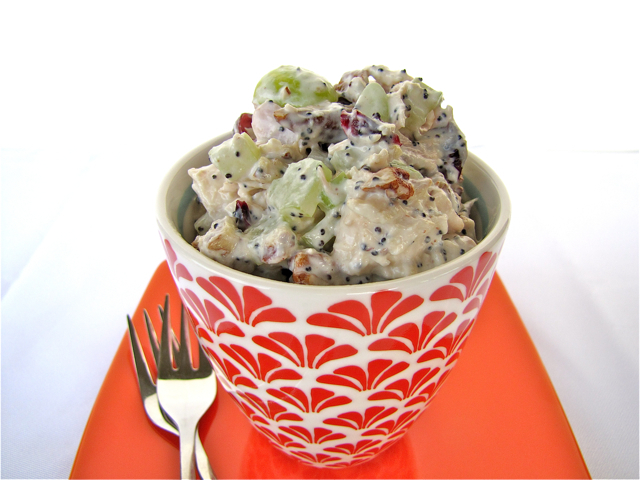 In a large bowl add chicken, celery, green and red grapes, and dried cranberries. For the dressing whisk together sour cream, mayonnaise, lemon juice and poppy seeds. Add salt and pepper to taste. Gently toss chicken mixture and dressing together. Refrigerate for about 1 hour. Fold in toasted pecans right before serving. 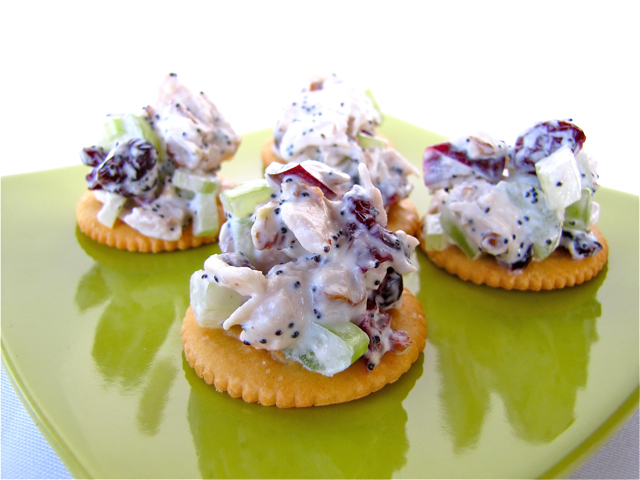 This is how I like my chicken salad--with pecans and grapes but I haven't tried it with cranberries and can just imagine how much that tart sweetness is with the salad! I love how the poppy seeds look in it as well.